STOCKHOLM, SWEDEN–No paleontological expedition is complete until it includes time in the collections of a museum. No single sampling trip like ours can describe the full diversity of a fossil site, no matter how many days we spend scouring the rocks. A traditional museum will combine the finds of hundreds of scientists over two centuries or more. 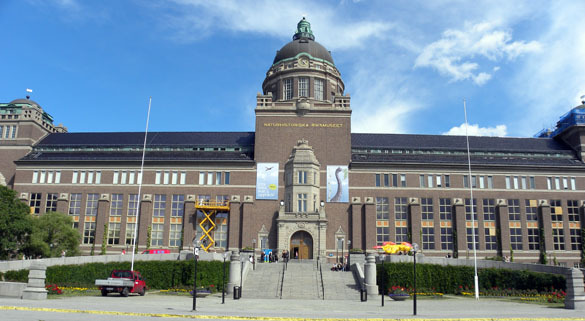 The very best natural history museums, such as the Natural History Museum in London, the Smithsonian Institution National Museum of Natural History in Washington, DC, the Muséum national d’Histoire naturelle in Paris, and, of course, the Naturhistoriska Riksmuseet in Stockholm (shown above), have international collections from around the world. They set global standards for the documentation of living and extinct biodiversity. They are cathedrals of science to which we make regular pilgrimages, with all the awe and obligation that word includes. 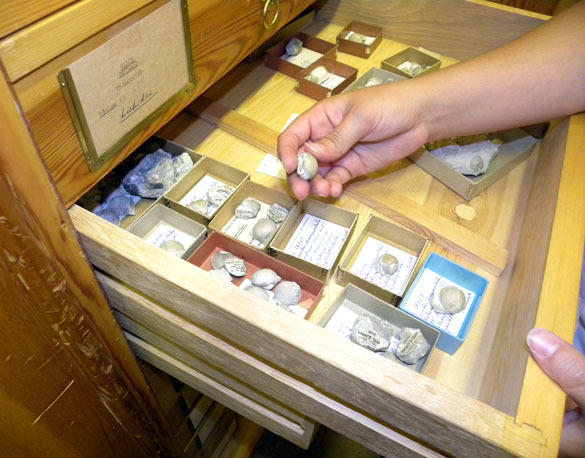 The Naturhistoriska Riksmuseet (Royal Museum of Natural History; NRM) has the best collection of Silurian fossils in northern Europe, so we were anxious to go through the drawers and learn what we could about our own Silurian observations in Estonia. 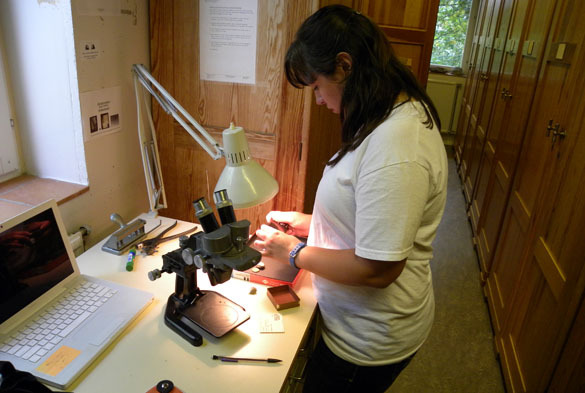 Thanks to Jonas Hagström, Senior Assistant Palaeontologist, we were given full access to the Silurian paleontology section. 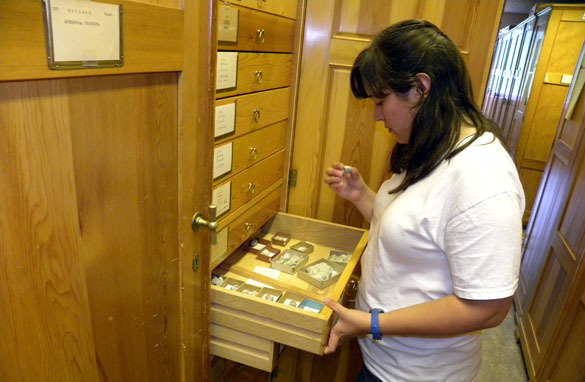 Rachel Matt investigating the contents of a drawer in the NRM Silurian collections. Note the proper way of pulling open a specimen drawer: always have the drawer beneath partly open in case you accidentally pull the top drawer out too far! Rachel making a simple photographic record of those fossils she finds that are similar to ours or should otherwise be documented for our work. Note that she has her computer open so that she can compare our field images to the museum specimens. 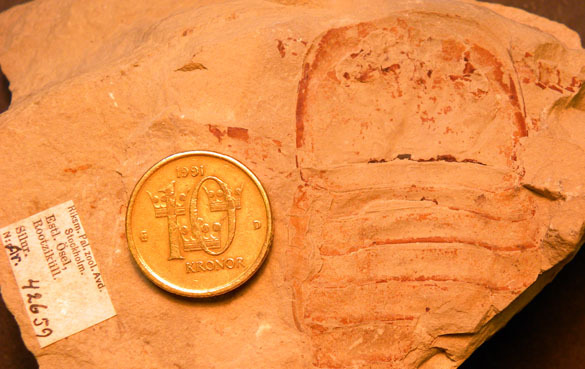 Nick found an excellent collection of eurypterids from the Rootsiküla Formation (Wenlock) in Estonia. He worked with these rocks in the field, but did not find any recognizable eurypterid fossils. Now he has a nice photographic collection of those in the NRM Silurian section. After we finished our work in the collections, we toured the public displays in the NRM main building. They are fantastic. 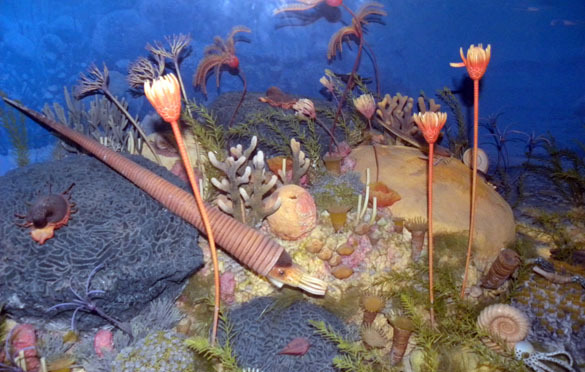 One of the highlights was this Silurian diorama showing many of our favorite extinct animals. By now you should be able to identify most of them! 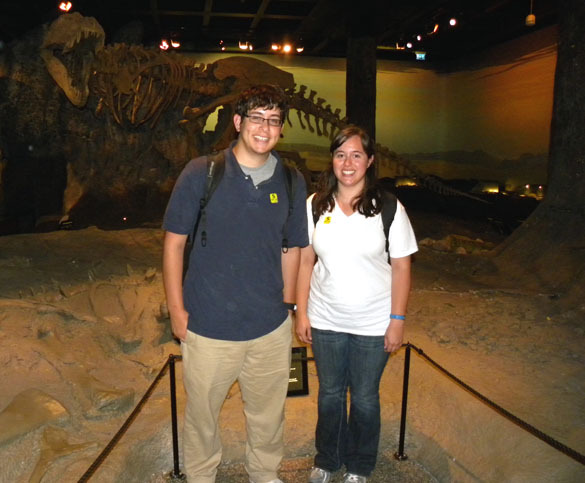 Our final portrait of the trip: Nick Fedorchuk and Rachel Matt with an appropriately menacing Tyrannosaurus rex in the background. Tomorrow we leave for home! It has been an exciting adventure of science and culture.